Dr. Obiamaka Mora grew up in Columbus, Ohio. She completed a combined BS/MD program. She received her Bachelor of Science from Kent State University in Rootstown, Ohio and her Medical Degree from Northeastern Ohio Medical University in Rootstown, Ohio. She received the honor of being inducted into the Gold Humanism Honor Society in recognition of exemplary service to others, clinical excellence, and compassionate and respectful relationships with patients, families, and colleagues. 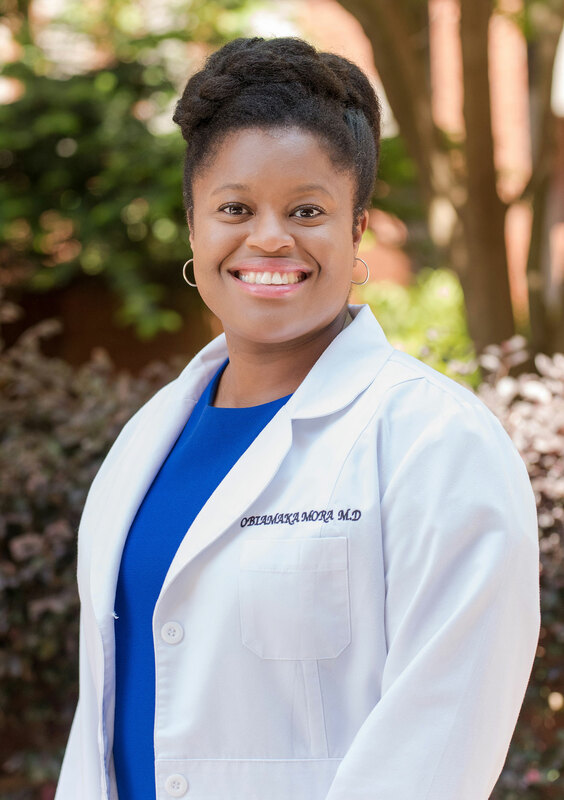 She completed a fellowship in Advanced Pelvic Surgery in Atlanta, Georgia. She is board certified in the practice of Obstetrics and Gynecology and a fellow of the American Congress of Obstetricians and Gynecologists (FACOG). Dr. Mora joined McDaniel & Durrett Gynecology in 2012 and oversaw the transition to Avant Gynecology in 2018. Her professional expertise includes minimally invasive and robotic surgery techniques with interests in pelvic reconstructive surgery, symptomatic fibroid management, endometriosis management, and bio-identical hormone replacement therapy. Gynecologists (ACOG), the American Medical Association (AMA), the American Association of Gynecologic Laparoscopists (AAGL), and the Georgia OB/GYN Society. Dr. Mora is the oldest of 8 children. Her hobbies include dancing, running, and cooking. Closed during lunch hours 12 – 1 p.m.
Avant Gynecology are Atlanta’s GYN and Surgical Specialists, serving patients at Piedmont Hospital in Buckhead and Northside Hospital. Avant Gynecology provides exceptional, compassionate care to women at every stage of their lives while staying at the forefront of knowledge and skill in the fields of women’s health and gynecologic surgery.